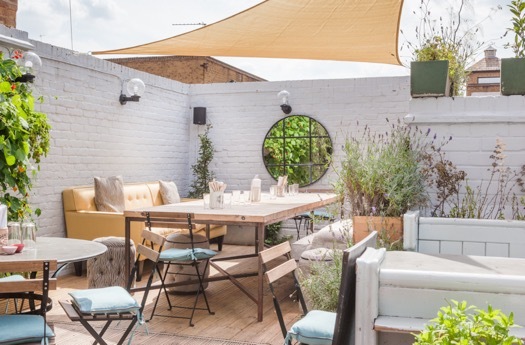 Following on from the huge success of last year the garden at The Imperial has just reopend bringing a little bit of Provence style serenity to the Kings Road. Forget what you’ve come to expect of traditional restaurant & bar gardens, this beautiful space is more an extentsion of the interior of The Imperial with large communal tables and big comfy sofas. Not only is it a great location in which to imbibe rose in the sun, it also includes, brand new for this year, the kitchen’s on-site fruit and vegetable garden. Putting the Imperial’s moto of ‘internationally inspired dishes, using only British, locally sourced produce’ into practice, gardener Charles Dowson and head chef Jason Lee Cole have come together and have created an excellent new vegetable garden. The garden produces, among other things, cherry tomatoes, runner beans, strawberries and sweet peas, all for exclusive use in The Imperial’s kitchen. This means not only zero food miles but also fantastic flavour that only ‘growing your own’ can bring. During the development of the garden comfort certainly wasn’t forgotten. Placed around the space are large communal tables, all-weather George Smith sofas and chairs, and several covered and heated areas for those cooler summer evenings. There are also large cushions, rugs and footstools making it feel more like an outdoor living room then a garden. The garden is also available for private hire. With its own side entrance and a capacity of up to 60 people seated or standing, it is the perfect venue for many special occasions, from birthday drinks to a wedding breakfast. The Imperial is open seven days a week, from 9am to 10:30pm (Sunday – Wednesday) and midnight (Thursday – Saturday). The kitchen does not close.